What’s amazing about this is that he enjoys THREE DAYS of “freedom” after a judge finally let him out (scroll to middle)! NERMEEN SHAIKH: We begin today’s show with news in a case Democracy Now! has been following closely. 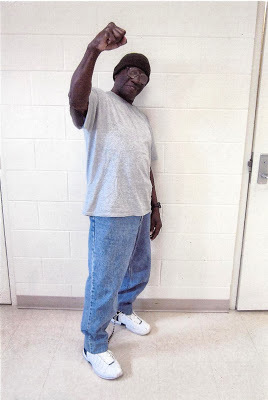 Herman Wallace, a member of the so-called Angola Three, has been released from prison after being held for nearly 42 years in solitary confinement. He was taken directly to the hospital, where he now lays dying of advanced stage liver cancer. GEORGE KENDALL: The courts—there are many tragedies in this case, and one of them is that the state judiciary in Louisiana knew for a long time that this trial was very unfair but just refused to grant a new trial—decades ago. When Judge Jackson finally took a look at this case, I think he concluded pretty quickly, “This is unfair, and I have to overturn it.” And to his great credit, he did so. Herman wrote to the judge, after he learned that he was diagnosed with terminal liver cancer, and said, “I’ve fought for 40 years to receive a new trial. Please, don’t let me die before I hear from you.” We filed a bail motion. A lot of federal judges don’t know this: They have the power to grant bail in these habeas proceedings. It’s rarely used. And Judge Jackson said, “I’m not going to grant bail now, but I will decide this case without delay.” Of course, we would have liked him to decide this quicker, but when he decided the case, he made it very clear—two things: The first trial was unfair, violated the Constitution—Mr. Wallace was right—and that he needed to be released today. And, unfortunately, it took state officials hours to comply with that. In fact, Judge Jackson had to issue a second order at 6:00 p.m. last night. And it was only, I think, because the prison knew that Judge Jackson was not playing, and we had an ambulance at the gate. The long and tortured life of Herman Wallace, of the famed Angola 3, was meant to terrorize us; to stifle the resistance that flamed throughout Black America (and many others across the country) during the ‘60s and ‘70s. If so, it failed utterly. For Herman Wallace, former Black Panther, despite the monstrous torture he sustained of 41 years in the hole of Angola (I will not dignify it with the name, prison) – slave plantation, was one who was caged precisely because, in mind, if not in body, he was free. 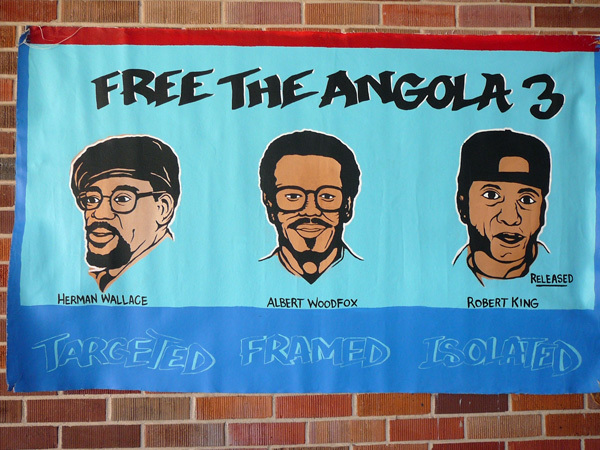 He was one of 3 me, his fellow ex-Panthers, Robert Hillery King and Albert Woodfox (the rest of the Angola 3), who exampled strength, determination, and will during their hellish times in Louisiana’s wretched dungeons. I have used the words; torture and I don’t use it lightly. Juan Mendez, Special Rapporteur for the United Nations, has found that solitary confinement, for any period past 14 days, constitutes real psychological torture that destroys human beings. 14 days. Herman Wallace, convicted on trumped-up charges under poisonous Louisiana ‘justice’, spent 41 years in solitary. In Angola. In Lousiana. In the United States of America. Forty-one years. Let’s put it another way. Herman Wallace spent 14,965 days in solitary. Herman Wallace spent 359,160 hours in solitary. Herman Wallace spent 21,549,600 seconds in solitary. When a federal judge tossed out his illegal and unconstitutional conviction, ordering his release, Herman Wallace, bed-ridden, spent 3 days in freedom, until returning to his ancestors. His flesh is returned to the earth, our Mother. Herman’s contribution to freedom, even while in the vilest dungeons in America, while in shackles and chains, in Angola, was immense. Herman’s death is heavier than a mountain, for he deserved more than 3 days of freedom, away from the stench of Angola and Louisiana ‘justice’. Yet, his death, his suffering, his torture, his loneliness reminds us all of the true nature of the System; and the dark, monstrous features of the Prison Industrial Complex; a complex of matchless cruelty, and unbridled savagery. Herman, Albert and Robert were subjected to such treatment because they courageously resisted and opposed such repression. They organized a chapter of the Black Panther Party while prisoners in Angola! So, remember Herman’s sacrifice; 41 years. 14,965 days. 359,160 hours. 21,549,600 seconds. May we all live to find such freedom! This entry was posted in american history, magazine, news, radio, television. Bookmark the permalink.